Anyway, the Jeep is as synonymous with Americans in WWII and Korea as anything else. Though the actual vehicles used for what was the jeep's original mission have changed, the concept is basically the same. A relatively small four wheel drive vehicle for transporting men and priority supplies as well as being used for light recce. Its ability to travel and relatively high speeds on prepared surfaces and yet go off road with little problem made the Jeep the icon of the war that it became. Even modern Jeeps are instantly recognizable as such for the basic look has been unchanged, though refined, since the early 1940s. The British 6pdr anti-tank gun was one of the most effective anti-tank weapons of the second half of WWII and one of the few guns that was successful with the Western Allies. Used by the US and commonwealth forces it was also modified to use in some tanks. The airborne units required one that would fit into a glider so the trails were redesigned to be foldable for more easy stowage. 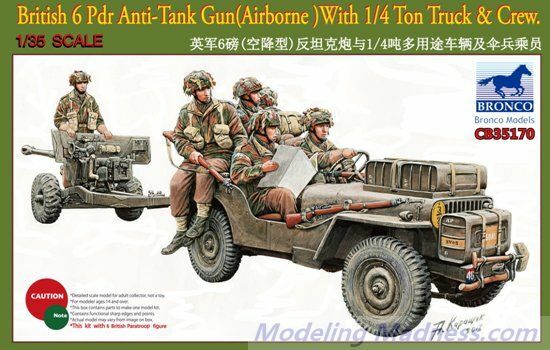 It was not that many years ago when the number of companies producing Jeep kits in 1/35 was small. Now it seems that any company that does a line of armor will include a Jeep. Of course, due to the undoubtedly exorbitant licensing fees now charged by companies for subjects produced for the government and paid for by taxpayers, this is simply referred to as a 1/4 ton 4x4 truck. 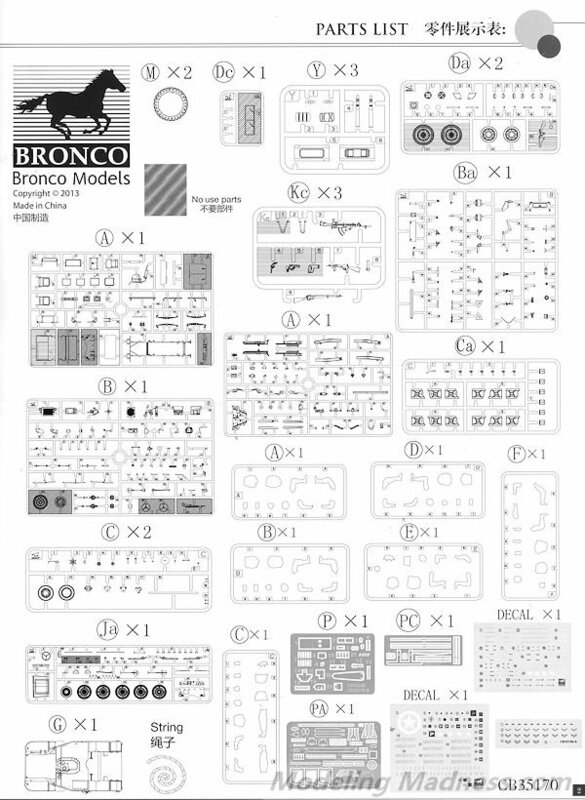 Typical of a Bronco kit, the detailing is superb and the kit contains a rather large number of parts for s uch a small model. This also includes several photo etch frets for use on the Jeep and the gun. The kit is not a curbside and comes with a nicely detailed flathead four banger. The one-piece chassis is where one will attach all the various suspension and driveline bits and pieces. This includes a full exhaust system. The steering can be built in three variations; straight ahead, left turn and right turn, each option having its own construction section. The interior provides the usual seating for four and one can have the aft storage bins open or closed. One can also put shrouds over the headlights if one wishes. The windscreen can be built with the glass open or closed; the entire assembly can be posed down on the hood as well. Same for the hood, which has parts for open and closed. However, if using the hood mounted stores, this and the windscreen would be modeled down. In the front one can install the standard bumper, one with a tow bar on it and another with wire cutter. This kit adds the bonus of the British 6pdr anti-tank gun and has been offered separately in its own kit. There are also six paratrooper figures to go along with the Jeep and the gun. Extra Jerry cans as well as additional storage containers to be strapped on the hood are also included. 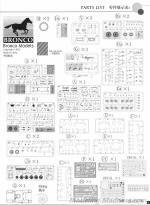 Instructions are superb as one expects from Bronco with 42 construction steps as well as color sections highlighting areas of the build. There is also a painting and assembly guide for the figures as well as a chart showing what badges and other data can be used together. As these were all painted the same color, no lengthy painting and markings guide is offered. The chart allows for seven different options. Decals are provided for the Jeep, the gun and stores as well as insignia for the uniforms. A very nice offering combining two previous kits into a single boxing. Makes one wonder just what Bronco will come up with next for their Jeep kit.